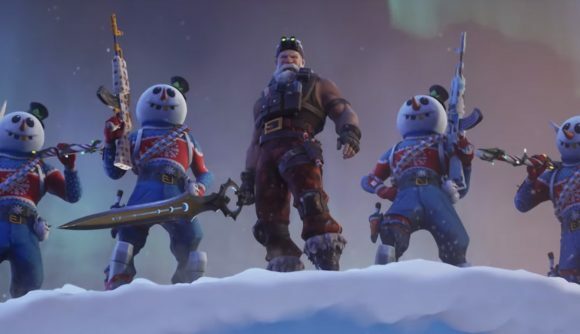 December 17, 2018 Fortnite’s Infinity Blade is mostly gone, but the spirit lingers. Infinity Blade might be gone in its original form on mobile, but the weapon just won’t die in Fortnite. Players are still picking up the sword in normal matches, and though the chances of that happening are now incredibly low, Epic’s acknowledged the problem and is working on a fix to destroy the Infinity Blade for good. Based on that, it seems there isn’t any exploit to grab the blade – it just sometimes spawns as it normally did before it got vaulted. Quemzi’s clip shows the wielder building with the sword equipped, so this is the pre-nerf version. It’ll soon be fixed, but if you’re playing ahead of tomorrow’s patch stay extra vigilant. The Infinity Blade was even more controversial among pro players, as it launched hours before the $1 million Winter Royale finals, and generally wrought havoc among the competition. Epic said in a Reddit post that more details on its “competitive philosophy when it comes to new items, updates and seasons” will come next week.